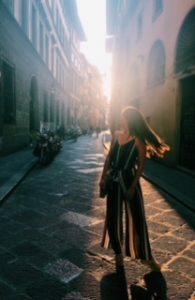 We recently caught up with SAI Ambassador Kinsey Kelly, who answers some fun questions about her summer in Florence. There are too many amazing memories to have a favorite! One of my favorite memories was a night when about fifteen study abroad students and I went to a local restaurant in Florence. The food was outstanding, the atmosphere was so much fun and the laughter and friendships that were built will last a lifetime. 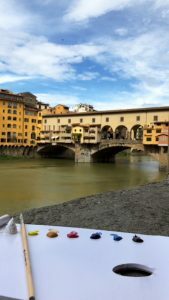 After we finished our exquisite dinner we all headed to the Florentine famous bridge, Ponte Vecchio, where we danced to the street band and ate gelato. 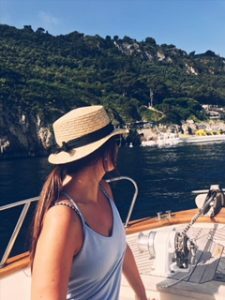 I felt like I was truly living the Italian lifestyle that night. My favorite class while abroad was my fashion merchandising class. It correlated directly with the SAI student run store, “FLY: Fashion Loves Me”. While in the class we did hands on merchandising planning projects, which was a great learning experience and also so much fun. We also studied different types of personal shoppers and learned about each. 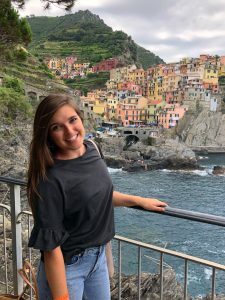 Kinsey was a summer 2018 SAI Florence student from the University of Missouri. She is now an SAI Ambassador.